Golden Kings’ always reliable workhorse Anthony McHenry showed his value once again scoring 22 points in addition to nine rebounds in Sunday’s 82-74 win. The competition was fierce, but in the end, the duel between the Ryukyu Golden Kings and Eastern Conference powerhouse Iwate concluded with a three-point win for the Big Bulls. The Golden Kings ten-game win streak was snapped by the Big Bulls, 69-66, in Morioka, Iwate Prefecture, in a nip-and-tuck contest. Iwate Coach Dai Oketani, formerly the Ryukyu Golden Kings head coach, was “deeply moved by people who visited to see our game in the cold and snow.” He credited his team’s “playing the game patiently” as the key, but predicted correctly that every time the Big Bulls play Okinawa, they lose the second game. Okinawa head coach Tsutomu Isa was prophetic in the loss, which extended Iwate’s string to 19 straight, calling it a “good experience for us. We should play patiently and carefully as we practiced.” Ryuichi Kishimoto led the Golden Kings in the loss with 19 points, while Draelon Burns logged 13, Anthony McHenry scored 12 and Hiromasa Omiya tipped in 11. Sunday was bounce-back day for Okinawa, snapping the Big Bulls’ winning streak with an 81-74 win. 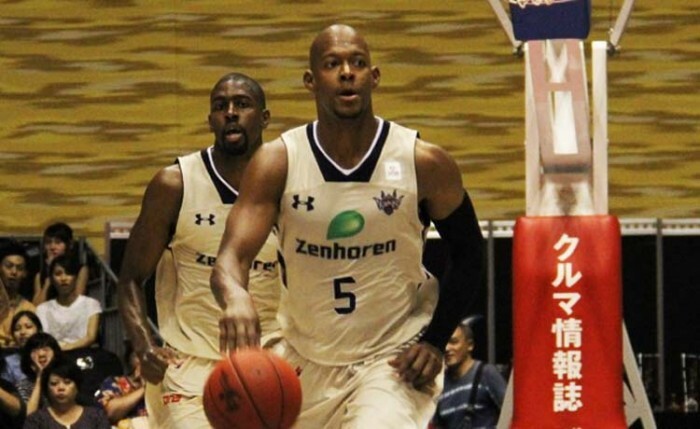 Anthony McHenry was scoring leader for Okinawa with 22 points and nine rebounds, while Draelon Burns poured in 19, Narito Namizato picked up 10 and Ryuichi Kishimoto nine. Okinawa’s now 17-3 on the season as they prepare to head to the warmer climes of home for the holidays. Iwate is 20-2. On the opposite end of the Basketball Japan League scale, the Sendai 89ers continued the brutally crushing season for the Saitama Broncos, punishing them and driving Broncos record to 0-18. The opener was close, 89-87, but Saitama just didn’t have any horsepower. Sunday’s loss was worse, 97-76, and the 89ers pressed forward with a 16-6 record. The Gunma Crane Thunders split a series with the Shimane Susanoo Magic, winning the opener 89-78, only to fall 80-72 on Sunday. Gunma’s now 5-15, while Shimane holds a 4-18 record. The Aomori Wat’s slipped past the Tokyo Cinq Reves 73-65 in their series opener, then needed overtime to win the second game, 84-73. Aomori is 13-9, while Tokyo drops to 4-18. The Niigata Albirex BB pulled off a 74-70 win over the Fukushima Firebonds in their series opener, but Fukushima pulled its own rabbit from the hat with a 59-54 Sunday win. The Albirex are 12-10, while Niigata’s 12-10. It was a winning weekend in Hamamatsu as the Phoenix picked off the Yokohama B-Corsairs twice in as many days, 108-69 and 83-58. Hamamatsu is now 17-3, matching the Golden Kings for top billing in the Western Conference, while the B-Corsairs slip to 4-18. The Akita Northern Happinets were also in the win column twice, dumping the Takamatsu Five Arrows 95-78 and 107-77. The Northern Happinets are 18-4, while the Five Arrows slip to 7-15. The Osaka Evessa roared to an 89-55 win over the Shinshu Warriors on Saturday, but Shinshu surprised the Evessa Sunday with an 83-75 win. It gives the Brave Warriors an 8-10 record, while the Evessa are in the hunt at 14-8. The Toyama Grouses couldn’t find the range Saturday, losing to the Kyoto Hannaryz 79-71, but they found the range on Sunday to snap Kyodo’s eight-game win streak with a 74-66 win. The Grouses are now 15-7, while Kyodo is 19-3. The Nara Bambitious had to work for its pair of wins over the hometown Oita HeatDevils, winning 80-78 and 81-77. The Bambitious are now 7-11 while the HeatDevils drop to 6-14.